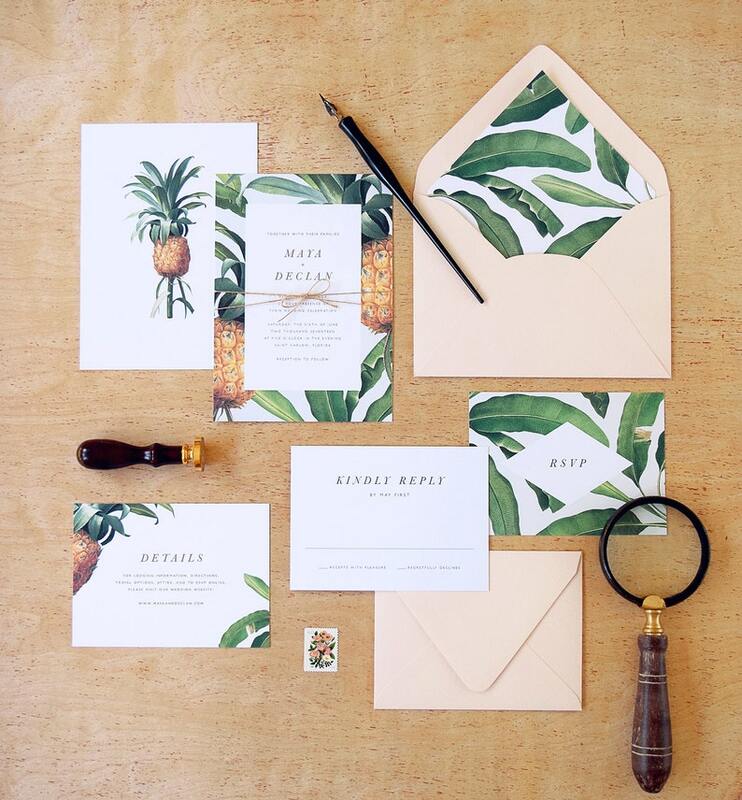 Pineapple and banana leaf botanicals together with mint and blush accent colors and modern typography create the perfect combination to set the tone for a tropical or destination wedding. 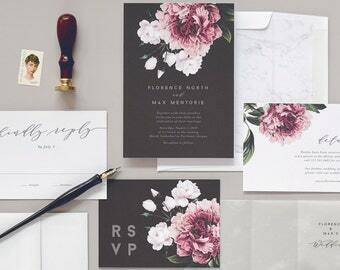 Replace the text color or envelope/s to match your theme and further personalize your invitation suite. Please message us for custom color consultations. Flat printing is high quality digital printing which uses ink on paper. This method allows a large combination of colors to be printed at once, for reproduction of painted and illustrative artwork. This method is only available on 110 lb. 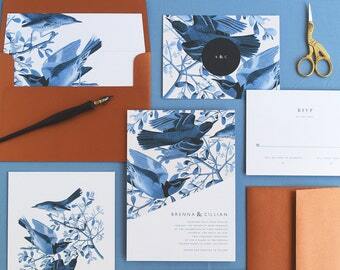 or lighter cardstock paper, but the paper can be duplexed for a double-thick feel. 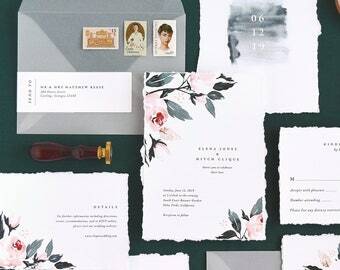 Both letterpress and foil printing can be added to a digitally printed card. Digital printing is not apparent on dark paper, which is why we only offer digital envelope address printing on our lighter colored envelopes. 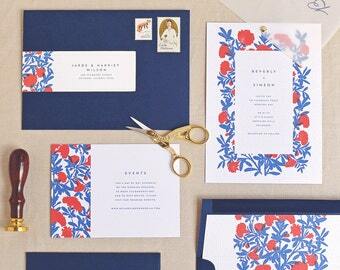 The invitation, reply card, and details card are flat printed on 110 lb. Crane's Lettra cover paper. It is 100% cotton, acid free, and soft and luxurious to the touch. 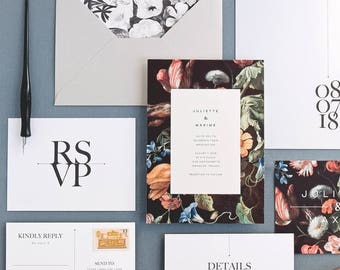 Usually a paper reserved for letterpress and gold foil printing methods due to its supple impression ability, this paper showcases digital printing with equal elegance. 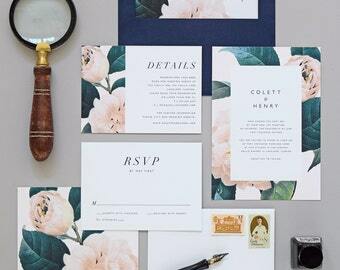 We have meticulously curated an extensive collection of envelopes, individually hand-picking each one to ensure that color, style and paper quality will seamlessly pair with our brand of invitations. 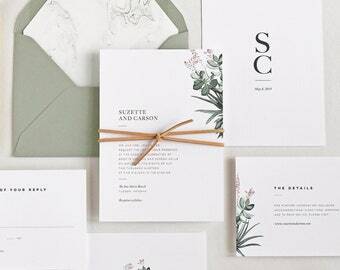 Each invitation suite from our line comes with a preselected envelope style/color, however, further personalize your invitation suite by customizing the envelope color. Envelope color chart available upon request. --> Let us know if you desire to replace the standard envelopes from this set before we proceed with a quote, as envelope pricing varies and will affect the price per set. For pricing, please message us with the quantity you are interested in purchasing. Also include in the message if you would like to go without the RSVP card or Info card. 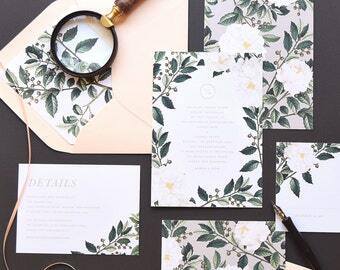 Rachel will then send you a quote that includes pricing according to paper option, along with pricing of the add ons that can be included with this invitation set. 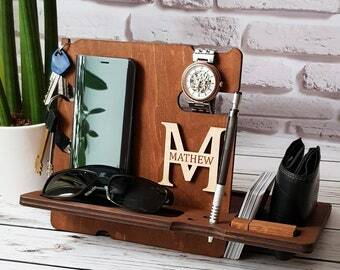 Once you have contacted us and we have discussed the details of your order and you are ready to begin, you will be emailed a PayPal invoice for a design deposit. This deposit is priced based on your order and is deducted from your order total. The remaining balance is due upon approval of your digital proofs in order to proceed with print production. Depending on availability, the deposit will also act to reserve a previously discussed order start date. Deposit pricing may vary for custom designs. Save the date orders and day of paper orders will be emailed a PayPal invoice for the full balance due. Save the date order payment can be combined with the invitation deposit and reservation (recommended). Upon receiving payment, we will ask you to provide via email the details for your invitations, including wording, color changes, and any other design personalization discussed (if a reservation for an order spot has been made, wording is not required until the start date). 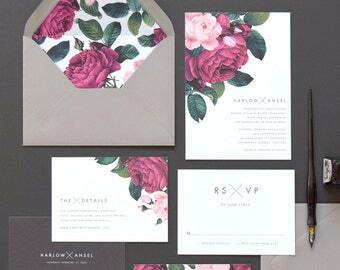 Rachel will then get to work personalizing a design from her collection or creating your invitations from scratch, depending on your order. Once the initial drafts have been completed (1-3 business days for designs from our collection, 1-2 weeks for custom designs), Rachel will email you a set of digital proofs for you to look over and approve. Up to 3 rounds of edits are included with your order, a small design fee will be charged for any additional rounds. Please double-check all spelling, grammar, text, and layout before signing off on your proofs, once approved Rachel Marvin Creative is not responsible for any layout or typographical errors. Please see details in our Policies for further information. Upon approval of your design, we will email you an invoice for the remaining balance due, if applicable. Production of your order will begin and order fulfillment will take place within our current project fulfillment times once final payment and approval have been made. Availability varies during peak times, and project turnaround depends on our current order load. Please contact us for current lead times and to reserve a spot to ensure your order is completed in time for your event. We usually recommend allowing 1-2 months for the entire process from design personalization to order completion. This does not include shipping, so if you are ordering from an international location please adjust for longer shipping times. Let us know when you are hoping to have your invitations in hand and we will do our best to work within your timeline. Please apply as early as possible as Rachel only takes on a certain number of custom designs throughout the year. 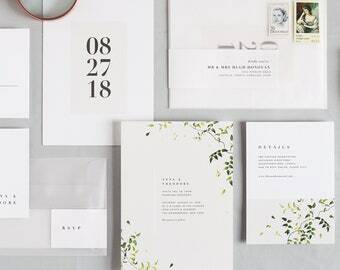 We recommend starting at least 2 months in advance of when you would like your invitations in hand. Orders can be expedited for additional fees. A rush may not be available during peak times, please inquire for applicable fees and rush fulfillment. you to download and print locally or online. 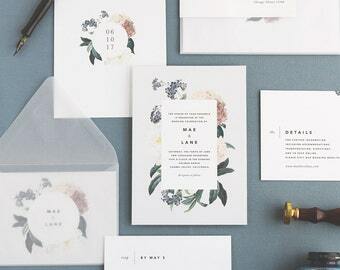 A standard printable package includes the invitation card, reply card and info card, additional items such as programs, menus, seating charts, and more are also available in printable format. Please contact us for printable package pricing and options. Super fast shipping for our sample. We will definitely be ordering these for my daughter’s Maui wedding. Very nice quality, even the lower quality paper option is beautiful. 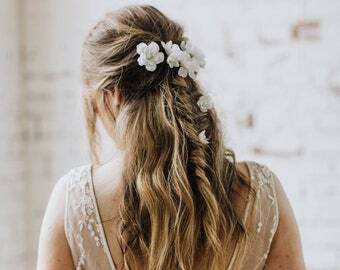 Unique and beautiful for a tropical wedding. For samples orders, we accept most credit cards and expect payment within 2-3 days after purchase. If payment has not been received within this timeframe, your order will, unfortunately, be canceled. All personalized order payments are placed via PayPal invoice emailed to the buyers preferred email address. Due to the custom nature of our products, all sales are final and design deposits are non-refundable once design proofs have been created. Rachel Marvin Creative cannot offer returns, refunds or exchanges in the event of cancellations or event changes. Once you sign off on the digital proofs, your are approving the design/s to be printed exactly as they appear within the digital proofs. Rachel Marvin Creative will in no event be responsible for any inaccuracies that might be found after that point. If an error in text is found after the point of approval, we will adjust the design at no additional charge. However, if printing of the initially approved proof has commenced, the client will be responsible for all applicable reprint fees. Your order will ship via USPS within 3-5 days after payment. Orders within the domestic U.S. will arrive 2-5 business days once shipped. Shipping times for international orders vary and arrival dates for orders shipped internationally cannot be guaranteed due to customs clearance processing, which varies from country to country and is not under the postal services or our control. The buyer is responsible for any and all duties and fees. Rachel Marvin Creative is not responsible for errors made by the buyer, such as errors in the shipping address provided. All orders ship via USPS Priority Mail unless requested otherwise. Orders within the domestic U.S. will arrive 2-3 business days once shipped. Shipping times for international orders vary and arrival dates for orders shipped internationally cannot be estimated or guaranteed due to factors such as customs clearance processing, etc...this can vary from country to country and is not under the postal services or our control. The buyer is responsible for any and all duties and fees. Rachel Marvin Creative is not responsible for errors made by the buyer, such as errors in the shipping address provided. 1 | Once you have contacted us and we have discussed the details of your order, you will be sent a tentative order outline and package total. Confirmation of this outline will be required before proceeding. Once the order details are correct and you are ready to proceed, you will be emailed a PayPal invoice for a design deposit. The deposit fee is based on the details of your order and is deducted from the total cost, with the remaining balance due upon approval of your digital proofs in order to proceed with print production. Depending on availability, the deposit will also act to reserve a previously discussed order start date. Deposit pricing may vary for custom designs. Once the order details are correct and you are ready to proceed, you will be emailed a PayPal invoice for the full balance due on your order. 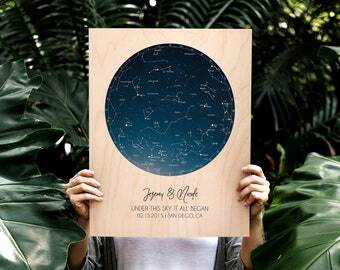 3| Upon receiving payment, we will ask you to provide via email the details for your invitations, including wording, color changes, and any other design personalization discussed (if a reservation for an order spot has been made, wording is not required until the start date). Rachel will then get to work personalizing a design from our collection or creating your invitations from scratch, depending on your order. Once the initial drafts have been completed (1-3 business days for designs from our collection, 1-2 weeks for custom designs), Rachel will email you a set of digital proofs for you to look over and approve. Up to 3 rounds of edits are included with your order, a small design fee will be charged for any additional rounds. Please double-check all spelling, grammar, text, and layout before signing off on your proofs, once approved Rachel Marvin Creative is not responsible for any layout or typographical errors. See our REPRINT section below for further information. 4| Upon approval of your design, you will be emailed a PayPal invoice for the remaining balance due. Production of your order will begin and order fulfillment will take place within our current project turnaround times once final payment has been made. Availability varies during peak times, and project turnaround depends on our current order load. Please contact us for current lead times and to reserve a spot to ensure your order is completed in time for your event. We usually recommend allowing 1 1/2-2 months for the entire process from design personalization to order completion. This does not include shipping, so if you are ordering from an international location please adjust for longer shipping times. Let us know when you are hoping to have your invitations in hand and we will do our best to work within your timeline. Please apply as early as possible as Rachel only takes on a certain number of custom designs throughout the year. 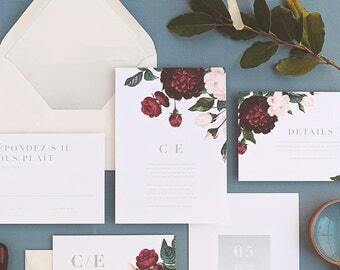 We recommend starting 2-3 months in advance of when you would like your invitations in hand.